UNITED NATIONS, Nov 2 2017 (IPS) - After the Rwandan genocide, the United Nations promised ‘never again.’ But has the international community kept their word? From Mexico to Myanmar, conflicts and humanitarian crises have multiplied. Millions continue to be targeted for their religious, national, racial or ethnic backgrounds, and some are even forced to cross borders to escape violence committed simply because of their identity. 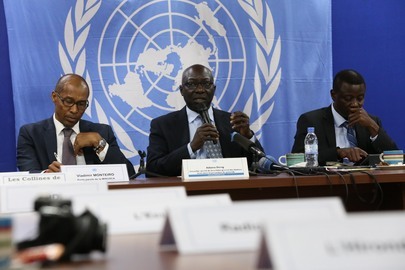 IPS spoke to the UN Secretary-General’s Advisor for the Prevention of Genocide Adama Dieng about these complex crises and efforts needed to avoid another Rwandan genocide. Q: As Special Advisor, what crises today are most concerning and should be paid attention to or acted on? A. The situations in the Central African Republic, Democratic Republic of the Congo, Myanmar, South Sudan and Syria are some of the places that I have raised concern about recently, although there are many other countries that require attention, including Iraq. In Syria, the atrocities that have been reported by the Commission of Inquiry have truly shocked the conscience of humanity, from the intensive bombardment of Aleppo last year to the alleged use of chemical weapons, as well as the continued besieging of thousands of civilians in flagrant violation of international law. Despite this, the Security Council has largely failed to take action to protect civilians and provide accountability for victims. When I visited the Central African Republic earlier this month I was told of serious violations against the civilian population, particularly women and children, for allegedly belonging to certain ethnic or religious groups. Despite progress made towards peace, there are still worrying occurrences of manipulation and incitement to ethnic and religious hatred that needs to be addressed by the government, with the support of the international community, in order to sustain the country’s fragile peace. Q: What steps can and must be taken in order to prevent genocide? A. History has shown that genocide and other atrocity crimes take place on a large scale, and are not spontaneous or isolated events; they are processes, with histories, precursors and triggering factors which combined, enable their commission. If you look at all of these conflicts, whether it is the Central African Republic or Myanmar or Iraq, there is one common denominator: exclusion. People feel that they are not included, so they resort to some form of violence for their rights to be recognized. So we can link these crises to the lack of respect for human rights, of observance of the rule of law, and also a problem of governance. All of these elements therefore confirm the close link between development, peace, security, and human rights. This is also one of the reasons why the Secretary-General made prevention a key aspect of his mandate. Unless you invest in prevention, you may not be able to achieve the Sustainable Development Goals (SDGs) or achieve the aspiration of sustaining peace. There will be no development without peace, and no peace without development. Unless we manage to make everybody included in whatever we are doing, we are set to fail at the national, local, and international levels. Unless the member state invests in having strong judiciaries, a strong and courageous parliament, strong and outspoken civil society, it will be hard for those governments to achieve something that is really durable. And it has to start of course at the local and national levels. If you make sure young people, including women, are included in all of these projects, you have a better chance to win your aspiration for development and peace. Q: The motto “never again” continues to be used in reference to the Rwandan genocide. Has the international community become better at responding to or acting on atrocities around the world? A. One of the principal roles of my mandate is to act as an early warning mechanism and a catalyst to mobilize action for the prevention of genocide and other atrocity crimes at the national and international level. In line with these efforts my office has also developed a Framework of Analysis for Atrocity Crimes that is used by the UN, member states and civil society alike to assess the risk of atrocity crimes and develop strategies to prevent these crimes. We are today able to identify the risk factors which lead to the commission of these atrocity crimes. We are able to identify those early signs, which is much easier today than it was in the past with new technology spreads information faster. What is required today more than ever is early action. For example, I have been calling for the last three years or more the attention of the international community on the situation of the Rohingya Muslim population in Myanmar but without much success. I identified the risk factors which were there, and I even went to the extent of writing an op-ed to draw the attention of the public at large. The main problem is the political will to act at the earliest stage. I think the Secretary General’s prioritization of prevention will hopefully play a key role in further enhancing the ability of the UN as well as the willingness of member states to act early to prevent situations from escalating to the point where there is a risk of atrocity crimes. My wish is from now onward is for the international community through the Security Council which has the primary responsibility for the maintenance of peace and security to be more determined to address situations before they escalate further. Preventing atrocities before they start continues to be the best way of ensuring that we live up to our commitment of “never again”. Q: Is what’s happening in Myanmar a genocide, or could it become a genocide? A. I think in Myanmar there were several warning signs of the violence we are now witnessing. I have repeatedly raised alarm of the risk of atrocities being committed against the Rohingya, and that is why I welcome readily the position of the Security Council to condemn the violence. But more needs to be done to act on this condemnation. What we are witnessing today needs to be thoroughly investigated. From the perspective of my mandate, there is no doubt that we are seeing elements which are very worrying—when you see a population being forcibly moved out of their location, their houses being burned, women being raped, people being murdered, and people having no choice than to cross the borders and when you see this was happening without condemnation from the Myanmar authorities. When Aung San Suu Kyi took to the floor for the first time, her speech raised more questions than answers. And that is why I do believe that if this situation is not addressed right now in a very energetic manner, the allegations being made that we are witnessing an ethnic cleansing will be confirmed. It is time for the Myanmar authorities to first and foremost stop the violence and to allow thorough investigation of the alleged atrocities being committed right now. Q: In Kenya, some have raised concerns that the persisting ethnic divisions in the country are reminiscent of what happened in Rwanda. What are your thoughts on the situation there, and should it be higher on the radar? A. What is happening in Kenya is a situation of concern. Ahead of the elections, my office had been monitoring the situation. We identified areas where we see a potential of violence and we invested and gave support to the Kenyan National Committee for the Prevention and Punishment of the Crime of Genocide, War Crimes, Crimes Against Humanity and All Forms of Discrimination. We supported their activities aimed to prevent the commission of atrocity crimes. Because we all remember that in December 2007 and early 2008, there was a spread of violence following the elections and nearly 1300 people were killed. There was definitely at that time ethnicity at play, and this was even the case that was brought to the ICC. If you take the 2013 elections, they went almost peacefully and my office as well as other international offices invested a lot in it. But I think we should give credit first and foremost to the people of Kenya who mobilized for peaceful elections in 2013. Now for the 2017 elections, it is remarkable to see for the first time in history, one may agree or disagree, that the Supreme Court really took a decision and I am glad the decision has been respected by the candidates. I wish that all actors were in this process and now we also have to make every effort to prevent further escalation of violence, to make sure that there is no hatred or hate speech particularly directed against one or another ethnic group. During the 2013 election, I made a very strong call to all candidates that whoever will be elected should commit that he or she will fight against tribalism. For the current situation, I now call on all the Kenyan leaders to make every effort to send clear messages to their followers to not go into any form of violence, and particularly using ethnic violence should not be tolerated. The law should prevail. This is the responsibility first and foremost of the Kenyan government but the entire world has an entire responsibility to contribute to preventing atrocity crimes. Q: Should the International Criminal Court play a greater role or be given more authority to prosecute those involved such atrocities? Where you have a weak judiciary and where you have lack of political will from the government to hold perpetrators of atrocity crimes accountable, then efforts have to be made to refer those cases to the ICC if that state concerned is not a state party to the ICC. Now we have countries which are state parties like Kenya who took the case of the 2007 election violence themselves before The Hague. The case at the end was closed because of lack of evidence but you have to remember, these are very complex crimes. And today in my view, we need definitely to use the ICC when states are failing to bring criminals before the courts. Impunity is not an option—we have to end impunity everywhere.